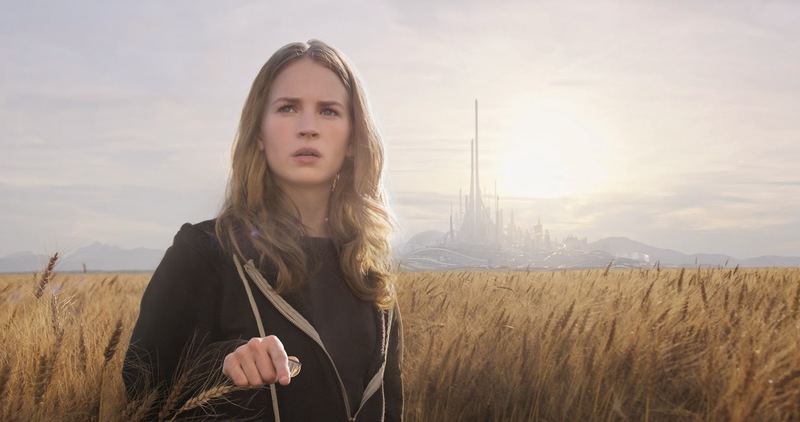 In Brad Bird's Tomorrowland, the future isn't what it used to be. From an opening sequence set at the 1964 World's Fair to the depiction of the eponymous city, a metropolis which mimics the futurist aesthetic of the Disney attraction of the same name, the film is awash in nostalgia for a future that never happened. By being partially set in a world of jetpacks, hovering trains and boundless creativity, it hearkens back to the world we were promised by the science fiction of the '50s and '60s; an altogether neater world in which science makes the lives of every human being better. It's a glorious vision wrapped up in a less than glorious film, one which stutters right out the gate with a wraparound conceit in which Frank Walker (George Clooney), a former boy genius, tries to tell the story of how he came to Tomorrowland in the '60s, only to be constantly interrupted by Casey Newton (Britt Robertson), a teenage engineering whizz who discovers the existence of that magical place and forces Frank to take her there, which in turn sets in motion events of global significance. The stop-start rhythms of the introduction, with footage being replayed and the starting point being constantly reset, is reminiscent of the opening to Shane Black's Kiss Kiss Bang Bang, but not nearly as funny or biting. It just feels like Bird and co-writer Damon Lindelof playing for time as they try to figure out what the story is going to be about. Tomorrowland recovers its balance once Casey discovers a pin which gives her glimpses of Tomorrowland whenever she touches it, and sets her on a journey to find Frank with the help of Athena (Raffey Cassidy), a young girl who is not quite what she seems. Yet even as the story barrels forward from set piece to set piece, the uncertainty suggested by the opening persists. The tone veers wildly between moments of awe and wonder, such as a breathless sequence in which Casey is taken on an extended tour of Tomorrowland by her mysterious pin, to moments of goofy comedy, such as a scene in which Casey arrives at a comic book shop (run by a game Kathryn Hahn and Keegan-Michael Key) in which kitschy ray guns prove to be deadlier than they initially appear. At its best, it mixes the two together seamlessly, as in the scene (highlighted in the brilliant teaser trailer) in which Casey first discovers the pin and freaks out over the things it shows her. The rest of the time, it feels like there are two separate films running alongside each other (along with a third film in which innocent bystanders are vaporised by sinister, grinning agents, something which the film pays so little attention to that it comes off as a horribly misjudged joke). The film exists in an uneasy middle ground between being broad and being thoughtful. It has a Spielbergian sense of wonder and adventure running through it, and a genial, breezy tone that makes it feel like it will make for decent lazy Sunday afternoon viewing when it hits home video. Yet it's also deeply concerned with the state of the world, and the question of whether humanity can save ourselves from our dozen impending apocalypses, and ultimately realise the future we were promised by the likes of Walt Disney. Nowhere is this discrepancy more keenly felt than in how the film treats its villain. They occupy the space of a typical sci-fi baddie in the story, but is played with such specificity and empathy for their point of view that their eventual fate feels unduly harsh. It's the perfect fate for a character in this kind of movie, but not for that specific character, who comes off as someone who did the wrong thing for the right reasons, rather than irredeemably evil. The dissonance between the way that the film talks about the value of humanity and the ease with which it kills people never sat right with me, and is the closest it comes to the casual misanthropy of someone like Michael Bay, even as the film's style is far more coherent and palatable. While the film is a visual marvel, one in which the special effects are used to create a genuinely awe-inspiring world that recalls the utopian beauty of earlier sci-fi, it's repeatedly undercut by its script. Specifically, the way in which it says too little about its plot and far too much about its themes. Anyone familiar with Damon Lindelof will recognise this phenomenon, as his work on Lost and Prometheus consisted largely of setting up mysteries, sending characters to chase them down, and rarely letting them share information that would let them help each other. It worked for the most part in Lost (even if the finale's way of dealing with all its questions amounted to little more than giving a ¯\_(ツ)_/¯ emoticon to the audience) because the mystery could slip into the background in order to focus on the characters. The mystery of what Tomorrowland is and what Casey will need to do when she gets there is the one thing driving the narrative, and the characters are merely pulled along for the ride. So a refusal to engage with it or have Frank or Athena explain what is going on to Casey feels like a case of adhering to a writerly tic even when it isn't appropriate to the story. The ultimate destination is fantastic and gorgeous to behold, but the path the film travels to get there is too frustrating to be all that enjoyable. While no one in Tomorrowland is willing to talk about what's happening, they are more than willing to talk about What It All Means. Not only will they talk about it, but the film will gladly screech to a juddering halt to let Nix (Hugh Laurie), the Governor of Tomorrowland, expound upon the theme of the movie for minutes at a time*, in the kind of monologue that Bird ridiculed in his earlier masterpiece The Incredibles. That message - science is good and humanity has the potential to do great things if we are only willing to make the necessary sacrifices - is incredibly noble, but it's one that the film makes pretty effectively through its actions, rather than by droning on about it. Brad Bird's background in animation makes him a natural visual storyteller, and there are several moments in the film where he conveys everything in Nix's speech without anyone saying a word. One particular shot, in which Casey climbs up a slope while the camera pans around her, ultimately coming to rest as she is silhouetted against a NASA launch platform, is a beautiful evocation of the film's belief in the wonder of invention and the glory of discovery. Bird also packs every frame with detail, particularly once the characters get to Tomorrowland itself, and finds fun and interesting ways to stage action scenes involving incredible and crazy technology (something which he previously excelled at with Mission: Impossible - Ghost Protocol). There are so many moments of simple yet effective visual storytelling dotted throughout the film that it's disheartening to see the very easily understandable themes beaten to death by the ham-fisted script. The frustrating dissonance between the things the film shows us and the things its characters say is ultimately what hurts it the most, but also proves to be its saving grace. It's not a bad film. It's carried along by the beauty of its imagery and Bird's skill for staging blissfully legible action scenes, and the cast are pretty terrific, with Britt Robertson being particularly winning in a Jennifer Lawrence way, while Raffey Cassidy makes a strong case for Athena being a more interesting protagonist. Yet its unwillingness to trust the audience to understand its message prevents it from being more than just diverting. Tomorrowland has a lot on its mind, much more than your average blockbuster, unfortunately it doesn't know when to shut up. *The way that the film builds its climax around an authority figure giving a long speech delineating its themes is merely one of the many ways in which the film mirrors Ayn Rand's Atlas Shrugged, an earlier story about a young woman who goes searching for a mysterious place created by geniuses who retreat from the world. I personally wouldn't describe Tomorrowland as endorsing Rand's ideas since, much like The Incredibles, it takes them and replaces toxic self-interest with altruism and hope, but it's interesting to see him return to that well again. I'd like to think that he did it purely to mess with the people who get into a lather denouncing The Incredibles as Randian, though.